“Hello darkness my old friend” is one of the classic lines in folk rock history and it’s the way the sophomore Simon & Garfunkel album, Sounds of Silence, opens. Released in 1966, just over a year after their debut and after Simon spent time in London playing the folk circuit as a solo artist, Sounds of Silence holds up quite well 45+ years after it was initially released. There are several spots on the album that provide touchstones for recording artists that came much later. Billy Bragg appropriated the opening lines to the catchy “Leaves That Are Green” for his track “A New England” (“I was 21 years old when I wrote this song, I’m 22 now but won’t be for long”), “We’ve Got a Groovy Thing Goin’” has a lot in common with Belle & Sebastian’s “Legal Man” and character sketches such as “Richard Cory“ are reminiscent of mid 90s period blur. 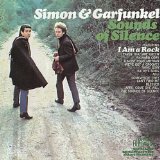 Besides the title track, two other classic Simon & Garfunkel songs appear on Sounds of Silence. The wistful “Kathy’s Song” and the utterly defiant “I am a Rock”. Music and book collectors everywhere can rejoice in the “I have my books, and my poetry to protect me” line after a particularly hard break-up. Sounds of Silence as an album is often overshadowed by what came down the pipeline in the great Bookends and Bridge Over Trouble Water. While a listener would be well served by starting with those albums, eventually you’ll want to discover Sounds of Silence. A strong yet understated album from one folk rock’s best, this is truly where the legend began.